Murals in schools visually reinforce key healthy lifestyle messages. The above mural is at Sierra House Elementary School in Lake Tahoe. On paper, the charge was clear: launch a statewide effort to integrate the nutrition education programs of USDA SNAP-Ed funded partners. Address childhood obesity and food insecurity holistically, yet specifically. Do this through policy, systems and environmental approaches that will leverage community participation and resources in order to create sustainability at the local level, and do it as funding is declining in SNAP-Ed programs. But what would this integrated effort actually look like in practice? How could a single effort weave together the many agencies, actors, and systems that influence a child's earliest years, a family's food selection, and school and community activities? How could the people around a table, some meeting for the first time, coalesce around a shared vision, let alone mutually agreed strategies? A problem as multifaceted as childhood obesity requires a similarly complex public health approach to meet the challenge. It is with this charge that over the past four years UC CalFresh has been working across California on nutrition education and obesity prevention with the California Department of Social Services, the California Department of Public Health, the California Department of Aging, and Catholic Charities to redefine Supplemental Nutrition Assistance Program-Education (SNAP-Ed, which is funded by the USDA Food and Nutrition Service). The SNAP-Ed mission in California is to inspire and empower underserved Californians to improve their health and the health of their communities by promoting awareness, education, and community change through diverse partnerships, resulting in healthy eating and active living. SNAP-Ed work is executed through county-led integrated workplans which now embody policy, systems and environmental (PSE) change in the body of work previously seen as a direct education program in schools and communities. Adding PSE activities to SNAP-Ed work acknowledges that a systems change approach that comprehensively addresses nutritional health where people live, learn, work, shop and play most effectively assures that children and their families will benefit from SNAP-Ed educational efforts. The first years of children's lives can determine the rest of their development. Technical assistance through education on food and food resource management coupled with assisting community members in making changes to their environment is a viable method of creating sustainable change. These types of comprehensive changes in schools and communities have been cited by a recent Robert Wood Johnson report to help children grow up at a healthy weight. Tackling obstacles such as access to affordable fresh fruit and vegetables, safe areas to recreate, safe routes to school, and programs/curricula that encourage physical activity are important aspects of initiating long lasting community health and lifestyle changes. Teaming with the Department of Transportation or environmental programs such as Resilient Schools can fuse nutritional work with those working in other areas that contribute to and foster a safe, healthy community. Wellness policies in schools that encourage good nutrition and physical activity institutionalize healthy lifestyle choices. Programs like the Smarter Lunchroom Movement help schools and students make the healthy choice in food and beverages the easy choice. 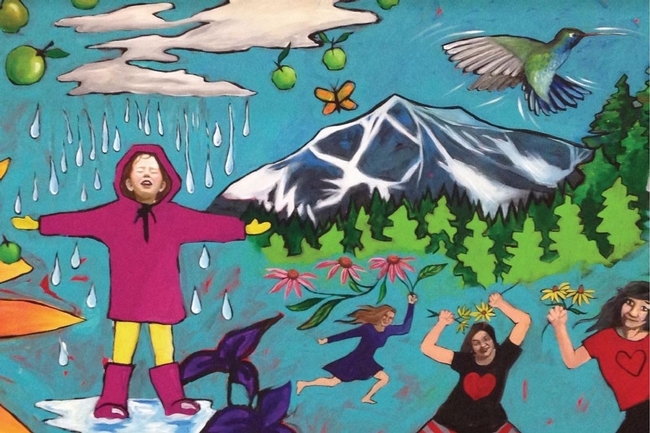 Environmental supports such as murals in the lunchroom or on school/community grounds visually reinforce key messages. On the playground, stencils depicting fruits and vegetables with key messages help motivate student's movement and play while reinforcing lessons learned in the classroom. Garden-based learning facilitates student and community members' exploration of low-cost methods to add fresh fruits and vegetables to their daily meal plan. 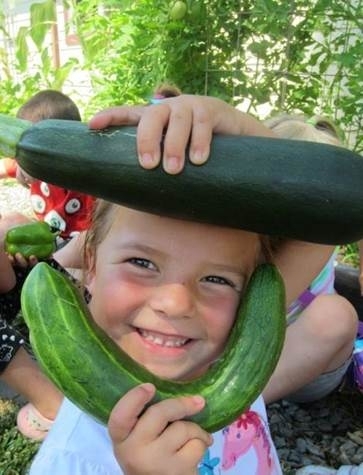 Research shows that nutrition and gardening experiences, linked to academic standards for a specific age group, can increase vegetable and fruit consumption and physical activity. Now, let's explore how these changes in the type of work executed through SNAP-Ed is poising California communities to tackle childhood obesity. There is general agreement through research that the first years of children's lives can determine the rest of their development. Across ideological divides, there is consensus that investing early makes sense — it helps children develop healthy habits that can last a lifetime — creating a high return on the investment of public dollars. However, in the end, support in counties from SNAP-Ed funded partners requires community leadership and long term ownership to succeed. Each community is armed with essential knowledge about local context to make sense of these levers and to pursue emergent opportunities. At the state and local level, the development and implementation of integrated workplans with community members input is a blueprint charting each counties course. The more we listen and support community members, bringing their ideas to the forefront of our work, the more sustainable our efforts will be. Fragmentation and silos create a diverse but disconnected sector. Communicate and connect as much as possible. As you get to know the community members and organizations that you are working with— together create your mission and values statement and make that your solidifying “call to arms” — then work transparently to fulfill your mutual objectives. Different settings, standards, and social norms create tension — successful systems change efforts face, rather than circumvent, these tensions…be respectful and “lean in”. As we review the many factors that lead to childhood obesity and food insecurity, use long term systems change strategies, foster sustained commitment, and celebrate successes, no matter how small. Reflect on how different organizations work and understand that your perspective may be a result of your vantage point. Try to be in another organization's or person's shoes, recognize their impediments, then work together with this in mind. Good strategies are shaped by reflection and steered with an understanding that there may be a need for course correction. A recent Robert Wood Johnson Foundation report concluded that between 2005 and 2010 California saw “a modest but significant decline” in childhood obesity of 1.1 percent in grades 5, 7 and 9. In addition, a 2013 Centers for Disease Control and Prevention report indicated progress in the health of California preschoolers enrolled in federal health and nutrition programs. The report cited that “obesity rates among 2-4 yr olds from low income families dropped 2.9 percent from 17.7 percent in 2008 to 16.8 percent in 2011.” This data speaks to the significance of a comprehensive approach in preventing childhood obesity. Further, it emphasizes the importance of the teamwork provided by a network of state and local agencies, acting with community members, to make a difference in the lives of children. Since 2004, schools have removed soda and other sugar sweetened beverages from premises. Since 2007, schools have limited the calories, fat saturated, fat and sugar in snacks sold on their premises. Since 2012, school districts have been required to make free, fresh drinking water available in school food service areas. Since 2006, $40 million has been committed in annual dedicated state funding for elementary school physical education.